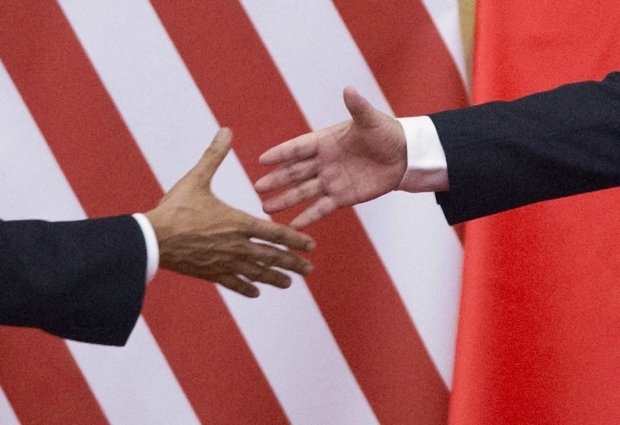 U.S. President Barack Obama (L) and China's President Xi Jinping reach out to shake hands at the Great Hall of the People in Beijing on November 12, 2014. The joint announcement on greenhouse gas mitigation by China and the U.S. last November injected new momentum into global efforts to avoid dangerous climate change. It recognized that the two countries have a common interest in protecting the climate, and that their leadership is needed. The forthcoming meeting between President Xi and President Obama should build on last fall’s announcement and translate political willingness into a practical action plan. A vital step going forward is a commitment by both countries to develop detailed long-term low-carbon transition plans. Deep emissions reductions require changes in the physical infrastructure and equipment that produce and use energy. Because the economic lifetimes of many key elements in the energy system—power plants, buildings, industrial boilers, freight trucks—are decades long, decisions made today have emissions consequences far into the future. A long-term plan that takes infrastructure inertia into account is an essential point of reference for all aspects of an effective climate strategy, from short-term policy to R&D priorities to sending the right signals to businesses and investors. Transparent sharing of such plans between countries is essential for trust-building and problem-solving. A model for this effort can be seen in the Deep Decarbonization Pathways Project (DDPP), an international collaboration among research teams from the sixteen highest-emitting countries, including the U.S. and China. The researchers—many of whom are key advisors to policy makers—have developed blueprints for sector-by-sector changes in their own countries’ energy systems out to the year 2050 needed to reduce emissions to a level consistent with limiting global warming to 2°C or less. These “deep decarbonization pathways,” which incorporate national goals for development and economic growth, provide clear insight into the physical changes, technologies, and investment that climate protection will ultimately require, and are a necessary complement to the prevailing focus on short-term policies and incremental reductions. Open sharing of these findings has already expanded the global knowledge base on what meaningful climate mitigation entails. For China and the U.S., transparently sharing low carbon transition plans has great value for bilateral cooperation in areas that have already been agreed on but whose implementation details remain fuzzy. For example, it provides an indispensable organizing principle for cooperation at the subnational level, among “early-peaking” cities or between states and provinces such as California and Guangzhou that have signed climate MOUs. For California itself, low carbon pathways studieshave been central to developing its leading-edge climate policies. Other areas of cooperation for which these plans form a critical point of reference include joint technology R&D, alignment of sectoral emissions standards, and mitigation of non-CO2 greenhouse gases. They provide better understanding of both mutual challenges, such as moving electricity generation away from coal toward low carbon generation, and mutual opportunities, such as expanded markets and trade opportunities in electric and fuel cell vehicles. China and the U.S. can send a critically-needed signal to the rest of the world before COP-21 by making a public commitment to develop and share long-term low carbon transition plans. U.S.-China engagement on climate and clean energy is missing a key component, which is cooperation in “soft technology” areas such as system planning, market design, operations, and regulation. Consider the electricity sector, which is critical to China’s efforts to improve air quality and reduce CO2 emissions. Electricity generation accounts for 50% of China’s coal consumption and (nearly 25% of global consumption). Reducing the share of coal in China’s generation mix from its current level of about 75%, is indispensable for meeting pollution and climate goals. A key long-term strategy for emissions reductions is electrifying transportation, buildings, and industry, but to be effective this requires electricity with a lower emissions intensity. The pathway to lower-emissions electricity in China is currently beset by a number of “transition” obstacles. Since broader economic reforms in the 1980s, China’s central government has never comprehensively reformed the electricity sector. In an era of sustained double-digit economic expansion, this mattered little. Institutional pressures were concealed by growth, and government agencies made periodic piecemeal adjustments designed primarily to encourage investment. The results were remarkable. In a span of just over two decades, beginning in 1990, China built the equivalent of the entire U.S. electricity system. However, as China’s economic growth slows, environmental pressures mount, and electricity supply and demand conditions become more complex, the lack of a rational economic basis for the sector is becoming more evident from both cost and environmental perspectives. High curtailment (discarding) of wind, solar, and hydropower generation, for example, are rooted in a combination of poor planning, misaligned incentives, and political economy. Cost-effectively addressing these challenges requires more fundamental reforms. Riding the global wave of deregulation, China began an electricity reform process in the early 2000s that never proceeded beyond the separation of generation and grid companies. A new reform process, begun in early 2015, promises to make deeper progress. Following Chinese policymaking practice, however, reform documents released to date provide only high-level guidance and leave implementation questions unanswered. A series of provincial pilots, likely to begin next year, will provide fodder for national reform strategies. The U.S. government has never actively engaged China on “soft technology” issues in the electricity or energy sectors. The Federal Energy Regulatory Commission has a memorandum of understanding with China’s National Energy Agency, but provides largely reactive assistance. The Department of Energy has a number of collaborative programs with China, mostly focused on hard technology R&D. Lawrence Berkeley National Laboratory and the National Renewable Energy Laboratory actively engage Chinese counterparts on a wide range of energy issues, but this work is mostly foundation-supported. This is a missed opportunity. The revival of electricity reform at the same time that China and the U.S. have agreed to collaborate on climate creates a real opening for government-to-government engagement. Given the importance of institutional change in both the U.S. and China for meeting CO2 emission reduction goals, greater collaboration on soft technology issues between the two countries is as important, if not more important, than traditional R&D collaboration.